Mrs. Carrie C. Smith, 100, of Campbellsville, KY, died on June 5, 2018 at Norton Women's & Children's Hospital in Louisville, KY.
Mrs. Smith was a native of Campbellsville, KY and the daughter of the late Henry and Mollie Redman. She was a member of Fannie Chapel CME Church. In addition to her parents, she was preceded in death by her husband, Ralph E. Smith, Sr. one son, Donald K. Smith; brothers, John, James, Lucian, Ralph and William and sisters, Gertrude, Georgia and Birdie. 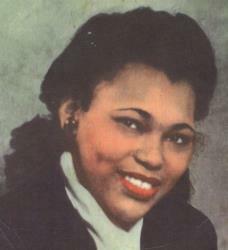 She is survived by one daughter, Opal Sickles (James) of Louisville, KY; one son, Ralph Smith, Jr (Barbara Jean) of Louisville; one sister, Yvonne Williams of Campbellsville, KY; grand children, Valerie Sickles, Vonda Sickles, Vivian Overstreet, Kevin Smith, Karen Blackburn, Carrie Starks, Keith Smith, Kelly Smith and Kim Bunton; fifteen great grandchildren and 8 great great grandchildren. Funeral service will be held at 1:00 pm on Thursday, June 14, 2018 at Fannie Chapel CME Church with burial to follow in the Lebanon National Cemetery. Visitation will be from 11:00 am to 1:00 pm on Thursday, June 14, 2018 at Fannie Chapel CME Church.